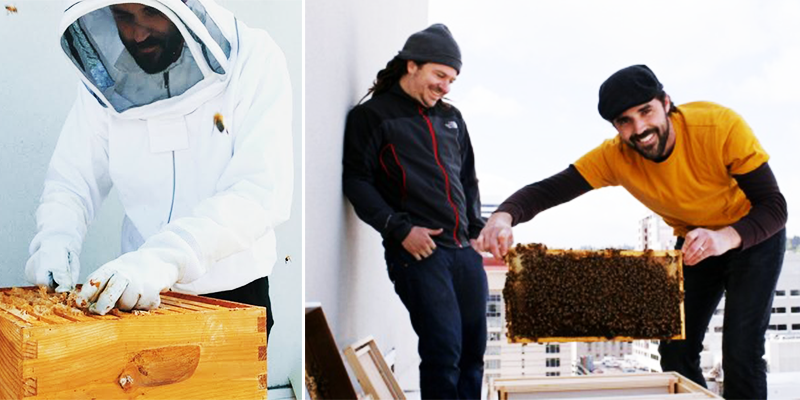 Starkus is the chef of Portland, Oregon's Urban Farmer, a modern steakhouse for the sustainability-driven, locavore set, located in the sky-high Nines Hotel—one of only a few rooftops in town playing host to a lush garden and some very stoked bees. Bees were totally new to me. 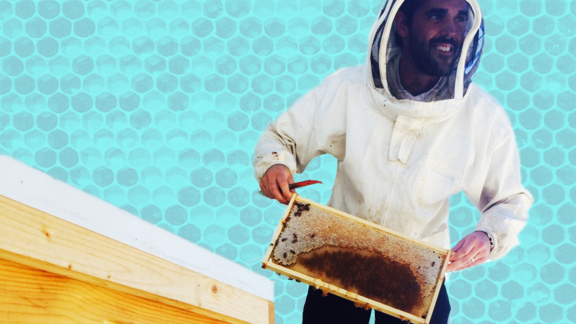 A few years ago, a company called Bee Local was starting to gain momentum out here, so I reached out hoping to get some bees on the roof of the restaurant. That first year, we had two hives. We harvested the honey, and I thought it was the coolest thing on the planet. We got about three to four gallons that first year, out of both hives, which is pretty rare. The following year, we expanded to four hives. The guys at Bee Local came every week, and we would open up the hives together and they’d talk about the health of the bees and how to inspect them, how invasive to get and how non-invasive to get, and I found myself—I know it’s a little lame, but—falling in love with it to the point that I just wanted to watch them. It’s just intuitive. You can learn so much just by watching the volume of bees going in and out. As I got more and more into it, they admitted that most chefs they get involved with aren't really into it like I was, which was very encouraging. I decided that I wanted to keep some at home, so they gave me a beginning beekeeper's book that I read on the bus. I went to a local company, and my son and I built up two hives together. The obvious use in all this is honey, but my wife makes candles with the wax at home now, and we’ve started to make lip balms. I pulled pollen last year, and we use that on our cheese cart. We use the honey in our vinaigrette for our salad, and I use a lot of it on some of our foie gras dishes as well, just as a highlight. This year is mostly about comb production. But really, as I read more about food production and growing and sustainability permaculture, it’s clear that it’s an integral part of what’s going on and what needs to happen. I feel like I know enough to keep them alive, but I need to know more. Just by being able to have that conversation— everybody in the hotel knows we have them now— we’ve been able to educate our consumers and our guests as to why we are investing in it and how it works to put food on their plates. That’s the biggest part. Starkus, and Bee Local's Ryan LeBrun on the roof of Urban Farmer | Images courtesy of Starkus and Sage Restaurant Group. Learning how to do this well has opened up the world around me; I take the time, at my house or on the rooftop garden with my cooks, to watch our bees and understand that they’re around us all of the time. I have a stronger appreciation for how long things take and conveying that to the guests. It’s easy to say a stalk of broccoli is ugly, or too small, but knowing that it took 80 or 90 days to even get to your plate at whatever the premium is means my cooking has become more about highlighting the raw ingredient than ever. It’s just like any hobby, or any love, or any passion. There is not necessarily a full ROI invested in it—it's about being close to nature. To be close to nature in an urban environment is something that really resonates with me; being able to go to the rooftop and check out the bees, and remember that there is this whole system out there working, whether I am paying attention to it or not, helps ground me when I’m in the kitchen. I always enjoyed watching bumblebees, and I was only scared of them because that’s just what I was taught when I was young. Now I go down to my hives at home every single day with my son, who’s six, and my daughter, who’s two. They love watching them too now, and know not to be afraid. I love sharing the story, I love telling people. As many people as I can affect, the better—whether they’ll start keeping bees themselves, or not. Instead of swatting at the bee next to you, maybe let them land on your glass to take a little drink of your water. That bit of understanding is the whole goal. Read an excerpt from 'Portland Cooks,' and cook your way through the city's best restaurants.